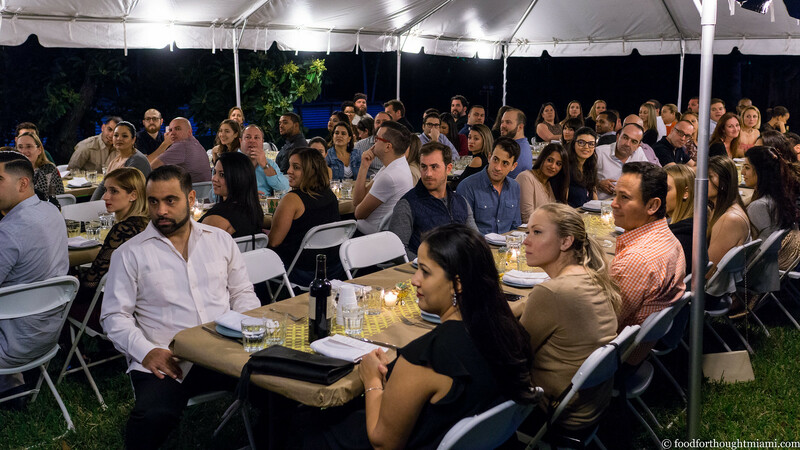 I knew when we agreed to do a Cobaya dinner way down in Homestead that, one way or another, it would be memorable. Actually, we had a pretty high degree of confidence that it would be memorable for the right reasons. 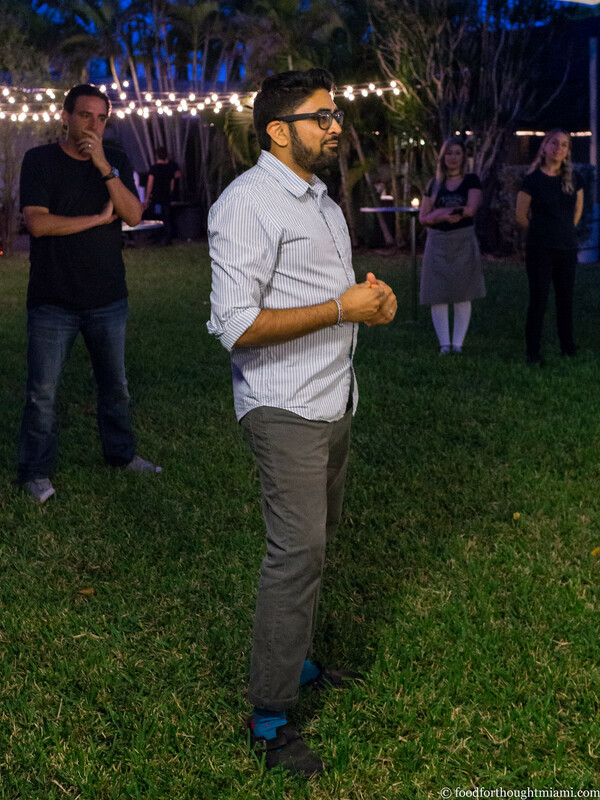 Our chef for the evening, Niven Patel, is a Michael's Genuine alum, and is in the process of opening his own place – Ghee – which will combine the flavors of his Indian heritage with the farm-to-table ethos of MGFD. 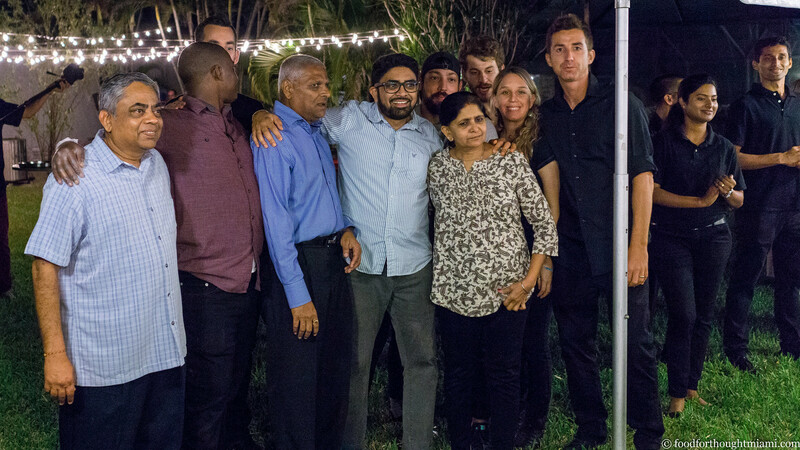 About a year ago, I got a preview of what Patel had in mind when he did a pop-up dinner at Genuine sibling Harry's Pizzeria. It was excellent. 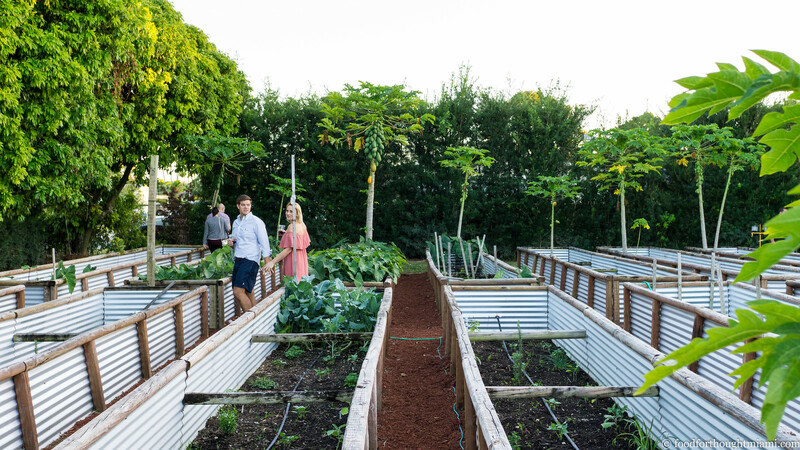 So when he said he wanted to host a dinner at his home and backyard farm, we found a way to make it happen. Our confidence was not misplaced. (You can see all my pictures in this Cobaya Rancho Patel flickr set). 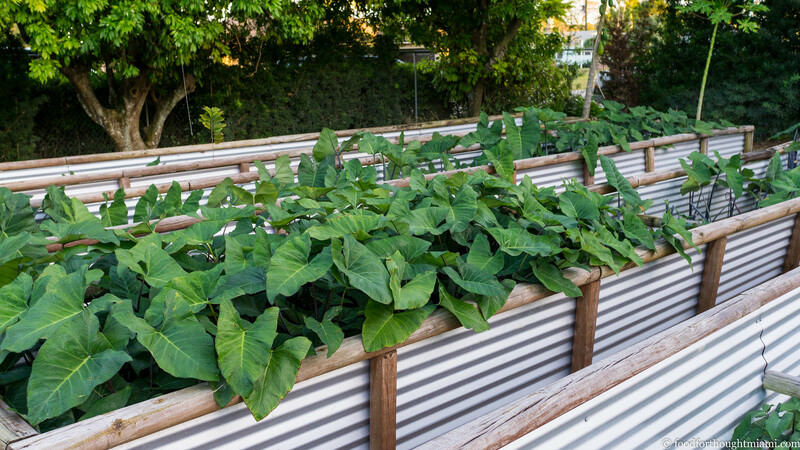 Our early 6pm start time meant there was still some late afternoon sun shining on the backyard garden, which Patel has planted with items that will eventually be used to supply the restaurant: papaya, taro leaf, chile peppers, herbs, greens, turmeric, root vegetables. A welcome cocktail courtesy of Edukos featuring "Ghee Wiz sake," basil infused mango juice, and spice-infused syrup, helped everyone slip into the right mindset. As folks made their way in, Niven's crew started circulating with an assortment of snacks. 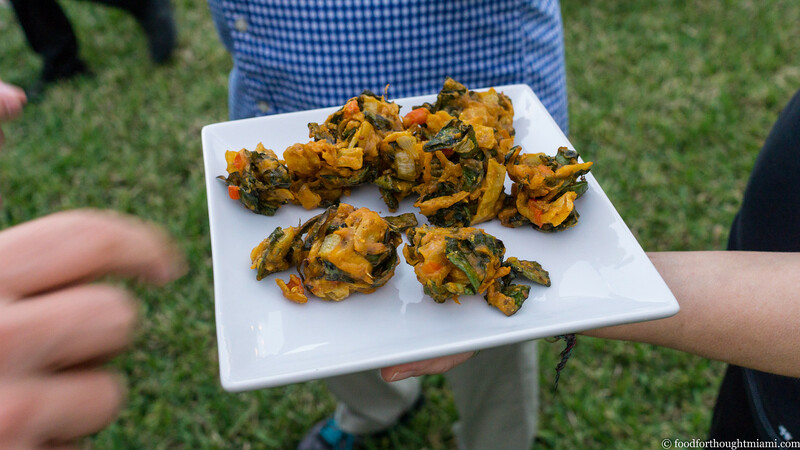 There were freshly fried pakoras of sweet onion and taro leaf from the backyard garden. 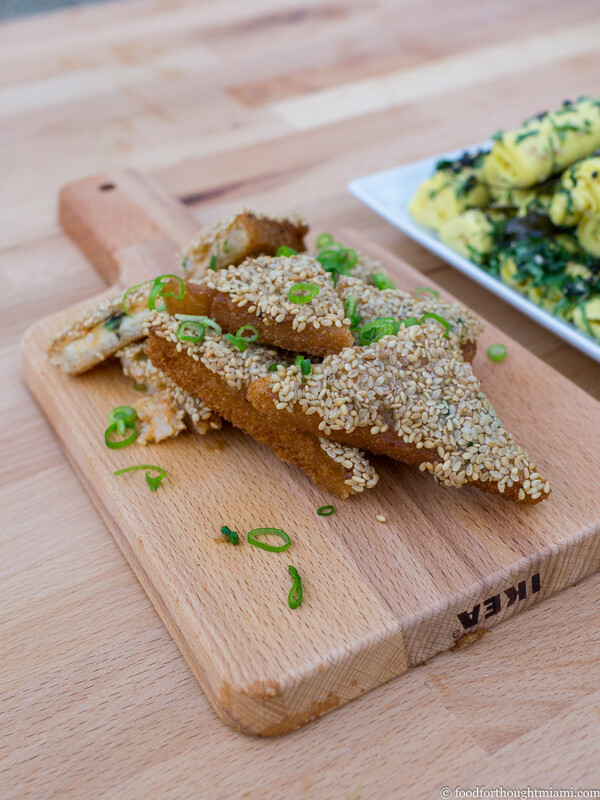 A paste of sweet Florida shrimp, sesame seeds and scallion topped a particularly tasty rendition of shrimp toast. And a special treat: khandvi, or as our menu called them, "chickpea roll-ups." This was something I'd never tried before, and for good reason: Niven says you're unlikely to ever see these unless your mother or grandmother is making them, as getting the batter – a mixture of chickpea flour and yogurt or buttermilk – and texture right is a bit of alchemy that could keep molecular gastronomists busy for a while. I was glad someone knew how to do it: these light, fluffy crepes, reminiscent of Japanese tamagoyaki, and seasoned with toasted black mustard seeds, julienned cilantro and curry leaf, were absolutely delicious. As the sun went down, Niven and his team (which seemed to include his entire extended family as well as the crew that will be working Ghee when it opens), continued to prep in the outdoor kitchen, while our guests settled in at the tables, and several rounds of dishes served family-style started to make their way out. 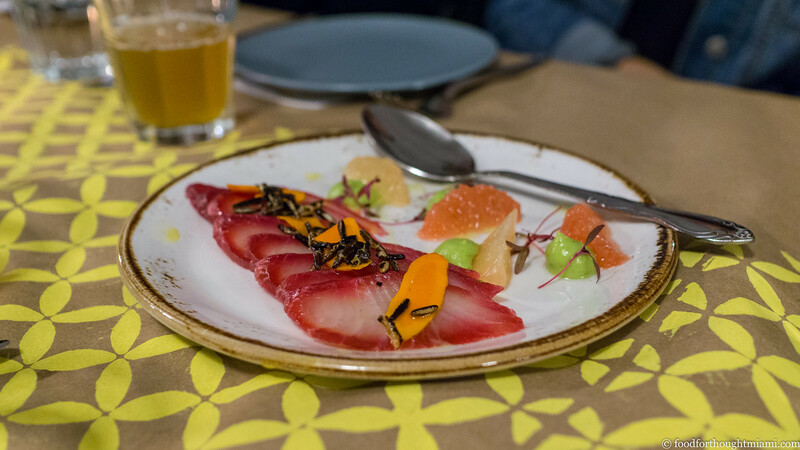 In the first round: luridly hued, beet-cured cobia, the flesh firm and sweet, topped with pickled yellow turmeric and puffed brown rice, and paired with fresh citrus segments and a creamy avocado puree. 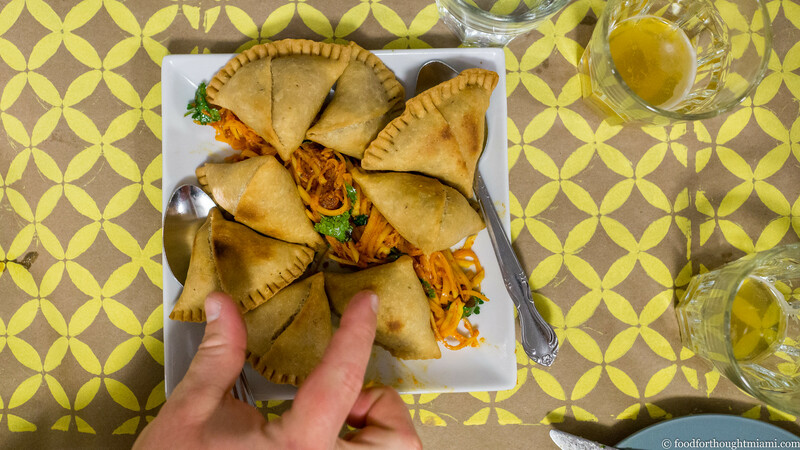 Miniature samosas filled with assertively spicy roasted chicken, over a green papaya salad with pickled garlic and peanut chutney. 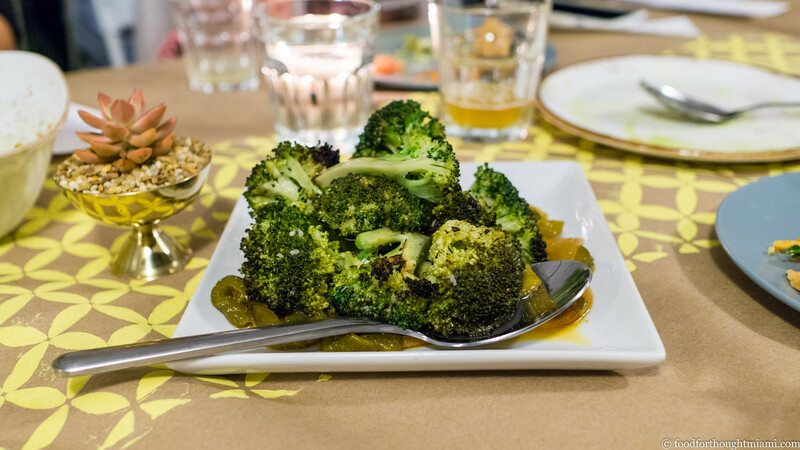 Broccoli, roasted tandoor style over charcoal, served over sweet marinated peppers and onions. 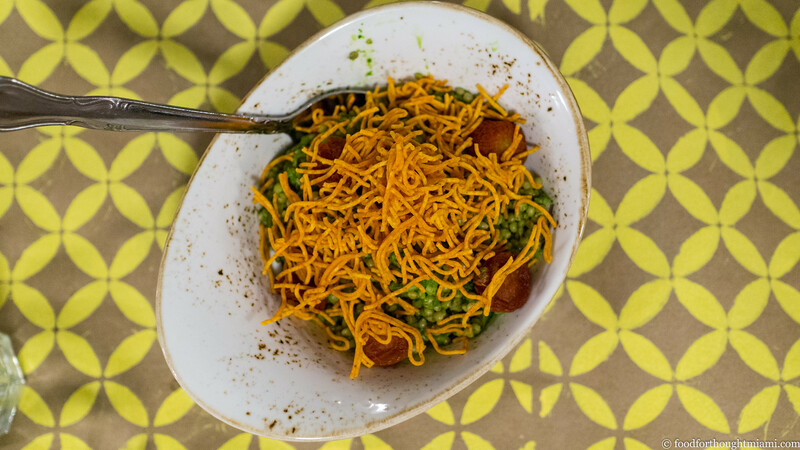 And my favorite, roasted green millet, brought in straight from India, done sort of in the fashion of a bhel puri chaat: with cilantro chutney, sweet half-dried heirloom tomatoes, and sev noodles. 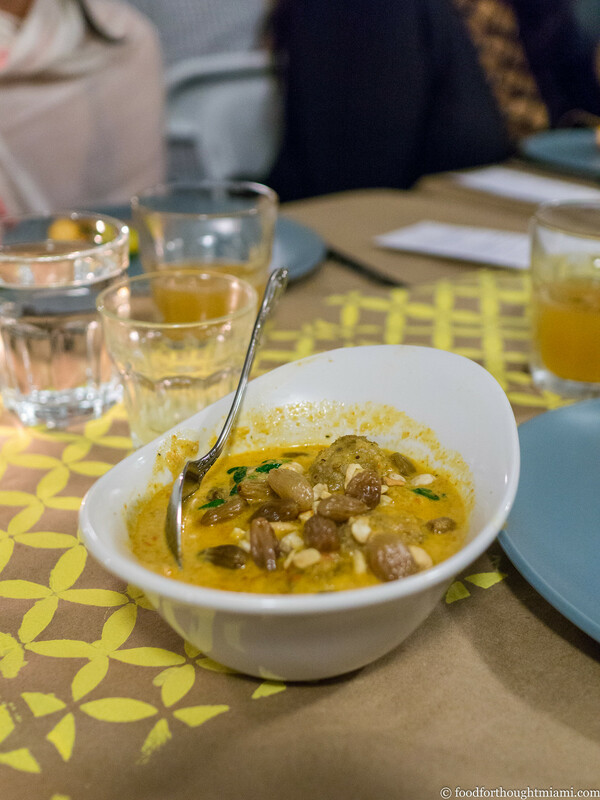 The next round brought lamb kofta, the tender meatballs swimming in a creamy sauce redolent of fenugreek and enriched with plumped raisins and toasted cashews. And then something you probably wouldn't expect at an Indian dinner: a massive dry-aged rib-eye, which had been marinated overnight in yogurt, generously dusted in spices and then skewered and cooked over charcoal. 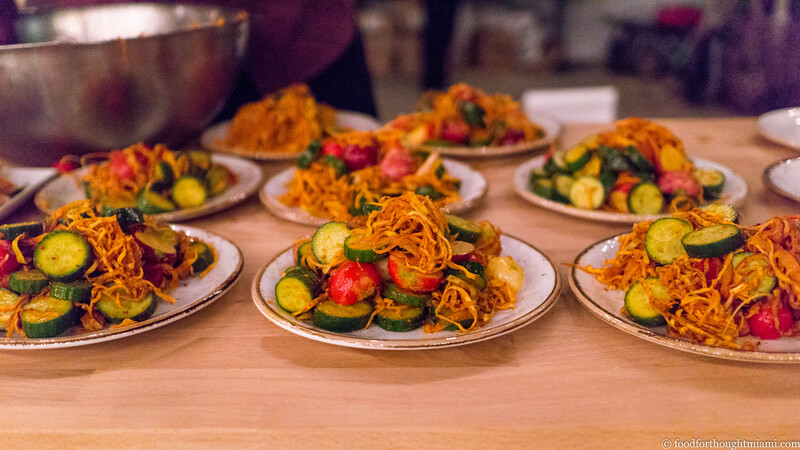 It was served with a tangy heirloom tomato sauce and an eggplant that had been roasted to the point of sweet collapse. This was another highlight for me. 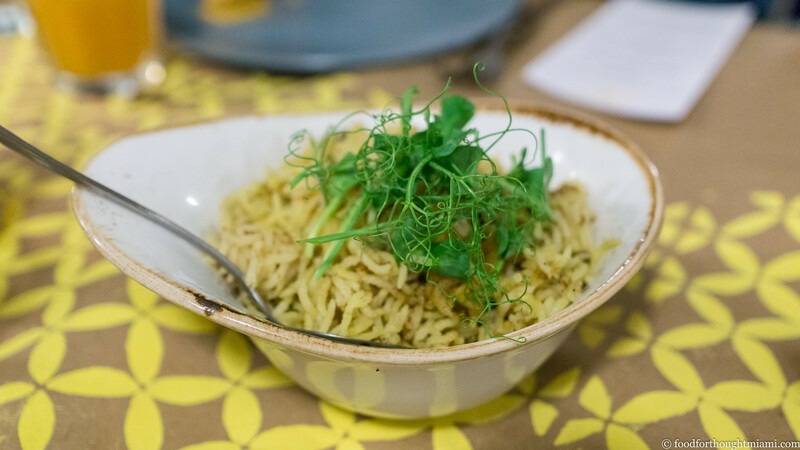 To accompany, we also had basmati rice flecked with black eyed peas, perfumed with curry leaf, and topped with wispy pea tendrils. And for some fresh, crunchy contrast, a salad of baby cucumbers, radish, and green mango spiced with chaat masala, acting a little bit like Korean banchan. Plus, fresh from the backyard tandoor oven, naan bread with a mix of grains. 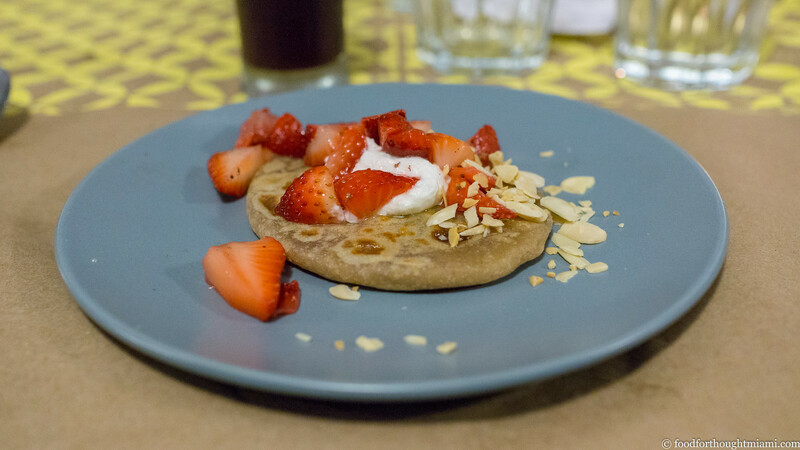 For dessert, Niven served a puran puri – a sort of filled pancake – which encased a bright purple yam purée (this also came from the backyard garden), topped with fresh strawberries and toasted almonds. And to close, a tray of mukhwas, the Indian equivalent of a starlight mint. I've always been a fan of these little blends of fragrant seeds and sugar pellets, which serve to both freshen the breath and maybe even aid in digestion. It wasn't until after these were cleared from the table and folks started to make their way out to their cars that the sitar and tabla players, who had been jamming all night, finally took a break and settled in for a well deserved meal themselves. 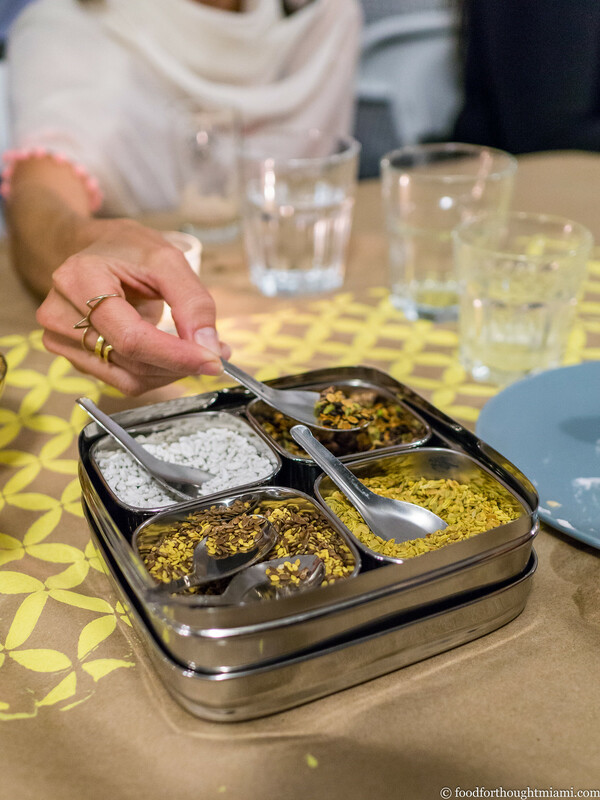 His cooking explores a range of Indian flavors beyond just the typical Punjabi dishes on most American restaurant menus, and he can do so in either a conventional or contemporary style. Add to that his attention to ingredient provenance and quality, and it is a particularly powerful combination. 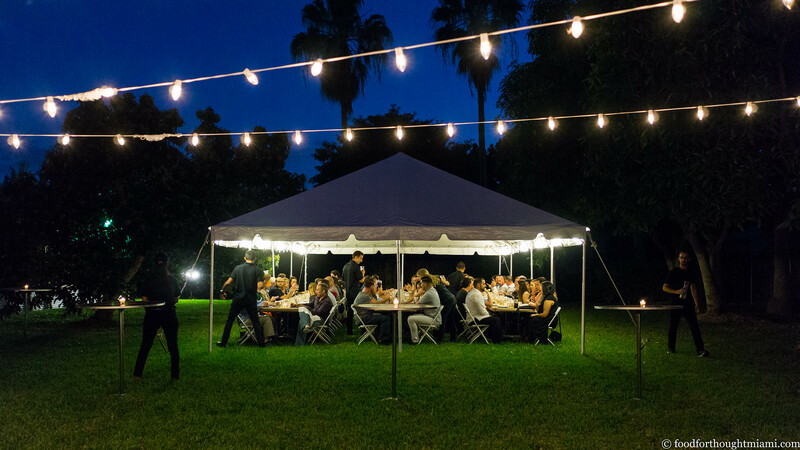 We've done a lot of these dinners; 69, to be exact. 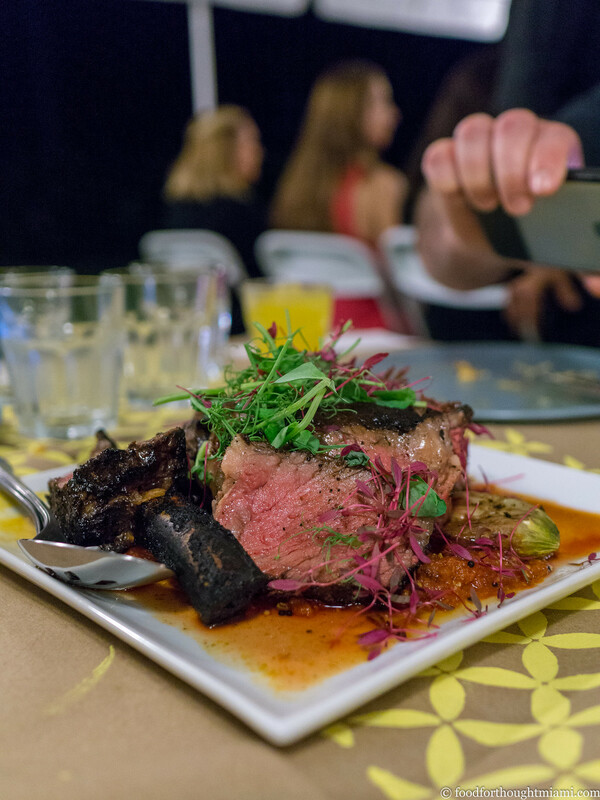 But this was a unique experience in so many ways – not just the food, but the setting, the atmosphere, the hospitality, the music. I'm so glad it came together, and that eighty of our guinea pigs got to be a part of it. A big thank you to Niven Patel, his family, and his Ghee crew; to Edukos for the beverage pairings; to Island Sky Water for the water that was poured at all the tables (using machines that extract drinking water from humidity in the air); and as always most of all, to the guinea pigs whose interest and support make these events possible. Ghee will be opening in Downtown Dadeland, hopefully very soon. 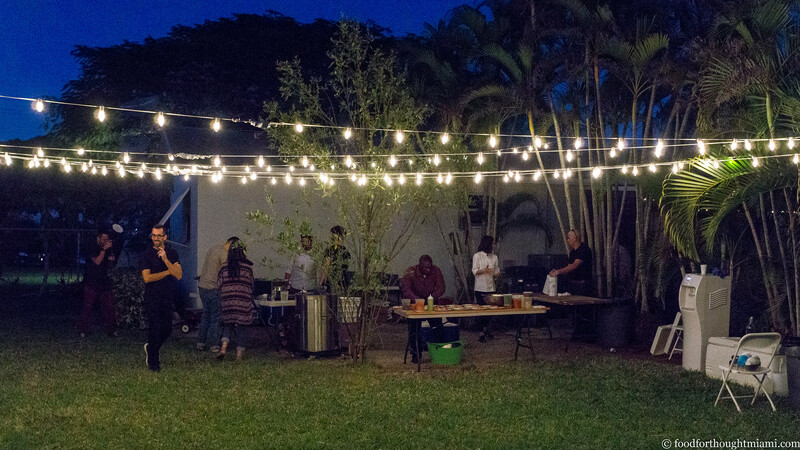 A similarly minded place, but with a Venezuelan bent, that's looking to open in Little Havana. 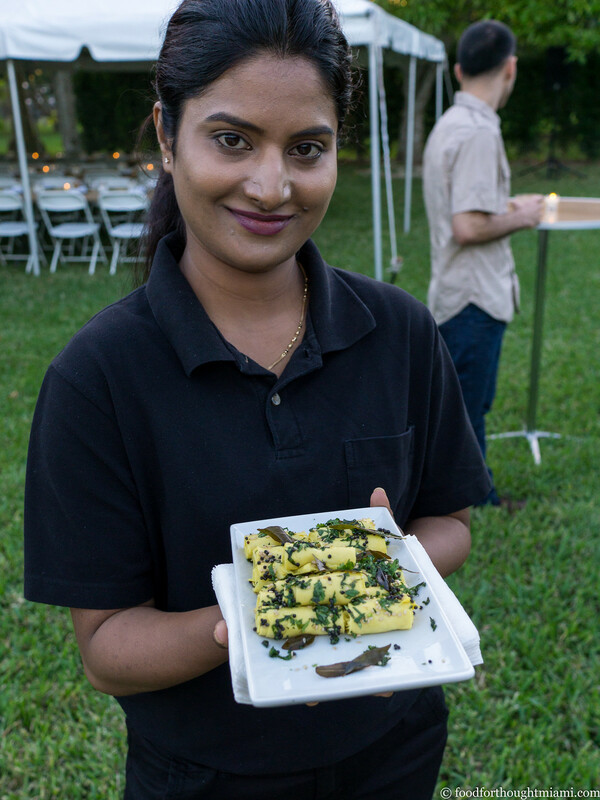 When one of our guests wrote to us that he had a farm in Homestead and would be glad to supply some produce to the chef, we quickly hooked him up with Patel. I think these black eyed peas and some of the tomatoes came from that connection.